November 30 is coming up and in Latvia it marks another remembrance day – the mass killings of Jewish people on November 30, 1941 in Rumbula forest near Riga. I don’t want to give the facts and statistics of how it happened or how many thousands got killed. 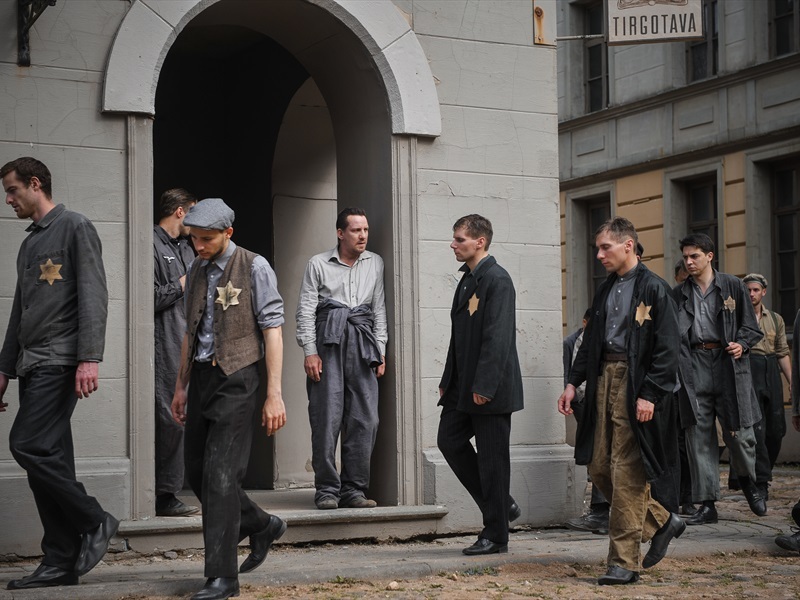 There is plenty of information available online, plus I have written before how we as a society in Latvia are still in the process of talking about, reflecting upon and learning from these very painful and shameful events of our past. In many ways here in Latvia we are on a very steep curve of learning and remembering while it seems that many people in Europe and around the world are on the downhill slope of unlearning and forgetting. Of course, not everyone in Latvia wants to know, to understand and to change their views or assumptions, but it is getting harder and harder to ignore it. There are more museums, more books, more media attention, more and more people who care to know. So, the movie is in the theaters, the remembrance day and lighting the candles at Freedom Monument takes place on November 30… meanwhile I turn on the news and watch programs about the rise of new kind of antisemitism in Europe and elsewhere. It is on the far-right and the far-left and many shades of it in-between. And I ask myself what is going on?! That is why I think antisemitism is also on the rise in those countries where the governing parties are very pro-Israel but very prejudiced against many different groups of people. In this sense any rise of nationalism is a rise of antisemitism. When we talk about ‘making our countries great again’ by which people often mean going back to some kind of ‘ideal’ past and ‘romanticized’ cultural identity we used to have, we are already on this downward slope. It is a whole package where it is very hard to pick and choose our prejudices for this kind of pride comes with strings attached. The experts mention that many people would be classified as ‘antisemitic’ because they hate the policies of the current state of Israel, especially toward the Palestinian people. I do not support this hatred in any way. Still, I understand a little bit about not liking a certain countries policies and the struggle to separate the issue. For example, I have many negative feelings and strong opinions about the current politics, ideologies and state of affairs in Russia and it is not easy for me to look at the Russian flag as something neutral or accept people who are very proudly Russian and nationalistic. I immediately start wondering if they support Putin or “Make Russia great again” which would put them in the ” other” camp. Some years ago I would have never imagined that my generation will have to have these inner struggles again of how to love the Russian people from our neighboring country while strongly opposing that country’s political direction. This one is hard. Not because I have nothing to say or because it is too complicated. No, it is because I am a Western Christian and also student of theology/religion. And there is no other international geopolitical issue which can divide Christians as sharply as the Israel-Palestine past, present and future. No matter how gentle or blunt, informed or ignorant, rational or naive, well intentioned or foolish I try to express myself. This is such a controversial conversation about a long standing conflict, historical justice, human rights and relationships, identity, understanding of the Scriptures and the importance of the land and so on. It is also very emotional because it touches people’s religious feelings in three major world faiths and makes an honest and open dialogue hard to achieve. But dialogue we must. Especially those of us who don’t live in Israel-Palestine but still have some impact through our personal connections, churches, religious organizations and also our governments which represent us as citizens. For example, if Latvia had decided to move its embassy to Jerusalem to follow the USA example (which it hasn’t) , I would form an opinion as a Latvian. Few days ago in downtown Rīga I was approached by a reporter and her camera person. I had to think fast about the question, “What is your opinion about Crimea?” What is she trying to ask between the lines? I assumed she was asking me about the latest news and how I felt about the newly built bridge between Russia and Crimea which is supposed to cement the Russian claim on this peninsula. How do I feel about it? Quite simple! That Russia is in the wrong and that Crimea was illegally annexed and there is historic injustice happening right before my eyes. And that most people around the world don’t really care because “out of sight, out of mind”. Plus, how are we going to make Russia give it back to Ukraine? It made me think if I would ever be asked by reporters in Latvia what I think about Israeli-Palestinian conflict. It is never “out of sight, out of mind”. That small corner of the world regularly makes the world headlines, mostly with stories of division, violence and suffering. And that is one of the big problems – the stories we hear are often superficial and tailored to ‘our’ ears. Or it’s very one-sided depending on our preferred news source and our own political and religious views. I have met, listened and read theologians from both backgrounds. One of the books on my shelf is “Through My Enemy’s Eyes: Envisioning Reconciliation in Israel-Palestine” written by Salim J. Munayer ( a Palestinian Christian and faculty member at Bethlehem Bible College) and Lisa Loden (an Israeli Messianic Jew and faculty member of Nazareth Evangelical Theological Seminary). I have met them in person and listened to their amazing, challenging and deeply moving journey as friends. The point I want to make is that if we really care, we need to seek out these local voices. People who actually live there and deal with this conflict on day to day basis as they have a much closer view on what is helpful or unhelpful to the peace process and reconciliation efforts. On things that our governments do or don’t do. On views that our churches support or don’t support. On what is loving and what is not. On what is just and what is not. Here is another book I recommend. “Light Force: A Stirring Account of the Church Caught in the Middle East Crossfire” by Brother Andrew, the passionate old Dutch minister. Who was very popular in the West when he wrote “God’s Smuggler” about taking Bibles behind the Iron Curtain and sharing his faith with the communists. But not so many Western Christians were interested when he started ministering in the Middle East, even meeting with leaders of PLO, Hamas, Hezbollah and other such groups. Brother Andrew is very open about his own preconceived ideas and Western Christian approach as an outsider trying to fix the problems in the Middle East. But nobody can criticize him for living out his passion for the good news of God’s love. It has to be good. It has to be news. And it has to be love for all people. Brother Andrew often asks what kind of people does the Book produce? Speaking of the Bible. We may have many strong opinions on who is to blame for failing peace efforts in Israel – Palestine and we may have strong beliefs about the eschatological future of this region, but we should never forget that this is not some theory for the people there. If I had been born in Gaza instead of Rīga, I would want the world to think of me as someone who matters. I certainly would not want to live in Gaza, a virtual prison controlled by air, land and sea. If I was a member of Gaza Baptist Church, I would want the brothers and sisters around the world to think of me and pray for our little, struggling fellowship who are caught in the crossfire. We have to make much more room in our hearts… this is what the Book says and does. If there is universal word and emotion in 2015, it is Fear. Phobia. Anxiety. Paranoia. This is nothing new for humankind even if we somehow think that the challenges are unique to our times and situation. Just study history, autobiographies, ancient literature like the Bible and see that people and nations have always struggled with fears and have chosen many different ways of dealing with it. Some wise, some foolish and even dangerous. Still, it seems that for our generation the events of 2014-15 and reactions to these events have taken a whole new level. This year I have been on three continents – Asia, Europe and North America – and fear is ‘in the air’. In people’s conversations and minds, publications, newspapers, internet, TV, radio, politician’s statements… and on and on. I am not immune to fear. You know, the common childhood fear of the dark, of ghosts, of snakes under my bed, of strange people, of unknown, of deep waters and hidden creatures. I also grew up in an atmosphere of fear during the Cold War which is a long story in itself. Then I started to travel the world because of my job and I have been in many ‘scary’ situations, but that is also another story. What I want to talk about is our current obsession with all kinds of ‘threats’. Inside and outside enemies. We are afraid and anxious but we keep feeding these fears until it becomes a self-fulfilling prophesy. For example, many of my friends in Thailand are afraid of ghosts and evil spirits, but they love going to horror movies. (As I often tell people in the US, the horror movies in Thailand make Hollywood-ones look like PG rated.) OK, I am not an expert but let me tell you – they are very disturbing. So, my Thai friends get even more afraid of evil spirits. Our neighbor across the street always left the room lights on during the night. True, many people can distance themselves from fiction but what about so called ‘non-fiction’? Like the news? We get into arguments how much of the news is actual facts and how much is ‘fiction’. My point is though that I don’t understand how people can feed themselves with this steady diet of fear. It is like the documentary “Supersize Me” but this time we are not talking about food but our phobias. Don’t misunderstand me. I follow the news. I watch the international news channels; I read stories online; I do my own research. I want to be informed but I don’t want to be formed by it. I want to be formed by those things that are Christ-like. Recently in Latvia I attended some very interesting lectures about our most common phobias. For Latvians, here is the link to Zanis Lipke Memorial Museum and the recordings of these lectures. All of us could give lists of names and things and global trends that we are afraid of. What are Latvians afraid of? At the top of the list would be Russia and the migrant crisis in Europe. What are Russians afraid of? I would have to ask my Russian friends but from previous conversations I know that there has been a steady diet of fear of the West, NATO and special mistrust of the US. I am sure that terrorism is on people’s minds, too, and fear of getting on airplanes now. Of course, Islamophobia is wide-spread. As evidenced by the shocking fact that Donald Trump can make bizarre statements and not feel like he has completely disqualified himself from leading a nation. We all have some very embarrassing (mildly speaking) politicians but he must be going for the prize. All of us – Christians, Muslims, Buddhists, Atheists… Latvians, Thais, Russians and Americans – are afraid of the exact same things: conflict, war, terrorists, unemployment, poverty, instability, fast change, the unknown, many of the aspects of globalization like migration, climate change. So, my question is – how much more afraid do we all want to get? How much more do we want to Supersize These Fears? Personally, I have had more than enough. Some fears and anxiety are reasonable and need to be addressed and discussed and wrestled with but the excess I want to vomit out. It is not nutritious for my soul. It poisons my whole being. Fear affects our mind, emotions, physical well-being, but worst of all, it erodes our relationships. It causes us to isolate ourselves or to start acting like mean dogs who attack and bite out of fear. Fear is a horrible and dangerous adviser and motivator. Šajā, 2015. gadā ir viens vārds un emocija, ko piedzīvo visā pasaulē. Bailes. Fobija. Trauksme. Tas nav nekas jauns, pat ja mums liekas, ka patreizējās problēmas un izaicinājumi ir kaut kas īpašs. Pietiek pastudēt vēsturi, autobiogrāfijas, senos rakstus kā, piemēram, Bībeli, lai saprastu, ka cilvēki un tautas ir vienmēr saskārušies ar bailēm. Un cīnījušies ar tām daudzos un dažādos veidos. Gan gudri, gan negudri un pat bīstami. Un tomēr 2014.-2015. gads ir nesis lielu izaicinājumu mūsu paaudzei, un cilvēku reakcija uz notikumiem ir pacēlusi šīs bailes jaunā līmenī. Esmu bijusi trīs kontinentos – Āzijā, Eiropā un Ziemeļamerikā, un bailes virmo gaisā. Gan cilvēku sarunās un prātos, gan plašsaziņas līdzekļos un sociālajos medijos, gan politiķu runās un darbos… un tā tālāk. Man nav imunitāte pret bailēm. Bērnībā piedzīvots viss – bailes no tumsas, no spokiem, no čūskām zem gultas, no svešiniekiem, no dziļa ūdens un visa, kas tur dziļumā čum un mudž. Arī bērnība Aukstā kara atmosfērā bija pilna baiļu un trauksmes, bet tas ir atsevišķs stāsts. Vēlāk darba braucienos esmu bijusi daudzās ‘bailīgās’ situācijās. Arī par to kādā citā reizē. Kam es gribu pievērsties šodien, tā ir mūsu pašreizējā apsēstība ar visāda veida ‘draudiem’. Gan iekšējiem, gan ārējiem ienaidniekiem. Mēs baidāmies un esam uztraukušies, bet turpinam barot šīs bailes, līdz pravietojums pats sāk piepildīties. Piemēram, daudziem maniem draugiem Taizemē ir ļoti bail no spokiem un ļauniem gariem, bet viņiem ļoti patīk šausmu filmas. Neesmu eksperts, bet Taizemē tās tiešām ir baismīgas. (Bieži esmu teikusi amerikāņiem, ka Holivudas šausmenes ir salīdzinoši vieglas.) Un lūk, mani draugi taizemieši vēl vairāk sāk baidīties no ļauniem gariem. Mūsu kaimiņiene pa nakti vienmēr atstāja istabu gaismas ieslēgtas. Protams, lielākā daļa cilvēku prot atšķirt izdomu no īstenības, bet ko darīt ar šo “īstenību”? Piemēram, pasaules ziņām? Mēs gan strīdamies, cik daudz šajās ziņās ir faktu un patiesības, un cik daudz ir izdomas vai pus-patiesības. (Arī tas ir labs stāsts citai reizei.) Mani nodarbina jautājums, kāpēc cilvēki sēž uz šīs baiļu diētas. Gluži kā tai dokumentālajā filmā “Palielini mani” jeb “Pārbaro mani”, kas rādīja ātrās ēdināšanas sekas. Šoreiz mēs nerunājam par ēdienu, bet gan par savām fobijām. Tikai nepārprotiet. Es sekoju ziņām – gan vietējām, gan pasaulē. Skatos starptautiskos ziņu kanālus; lasu rakstus internetā. Veicu savus pētījumus. Es gribu būt informēta, bet negribu būt ietekmēta vai iebīdīta vai iebaidīta. Es vēlos, lai mani ietekmē tās lietas, kuras mācīja un darīja Jēzus. Nesen Latvijā es apmeklēju dažas interesantas lekcijas par mūsu tipiskajām fobijām. Šeit būs saite uz Žaņa Lipkes Memoriālā Muzeja mājas lapu, kur ir šo lekciju ieraksti. Mēs visi varam sastādīt sarakstu ar vārdiem, lietām un pasaules procesiem, no kā mums bail. No kā latviešiem bail? Sarakstā būtu gan patreizējā Krievijas politika, gan bēgļu krīze Eiropā. No kā cilvēkiem Krievijā bail? Man vajadzēja pajautāt saviem krievu draugiem, bet no iepriekšējām sarunām zinu, ka viņiem ir bijusi pamatīga baiļu diēta – bailes no Rietumiem un NATO, it sevišķi no ASV. Domāju, ka arī terorisms ir cilvēku prātos, un negribas kāpt lidmašīnā. Ļoti izplatīta ir islamofobija. Kaut vai nesenie amerikāņu politiķa Donalda Trampa izteicieni un izlēcieni, un fakts, ka viņam nemaz neliekas, ka jau ir sevi diskvalificējis no iespējamā valsts vadītāja amata. Mums visiem ir politiķi, par kuriem (maigi izsakoties) kaunēties, bet Donalds Tramps cīnās par zelta medaļu. Mums… kristiešiem, musulmaņiem, budistiem, ateistiem… latviešiem, krieviem, taizemiešiem, ameikāņiem…bail no viena un tā paša: konflikta, kara, teroristiem, bezdarba, nabadzības, nedrošības, straujām izmaiņām, nezināmas nākotnes, globālās migrācijas un klimata izmaiņām. Tāpēc jautājums – cik vēl vairāk mēs gribam baidīties? Cik daudz vairāk gribam uzbarot un pārbarot savas bailes? Es jau esmu atēdusies. Bailes un trauksme ir normāla un saprotama reakcija, un mums par to jārunā un jāpārdomā un jālemj, kā rīkoties. Bet to, kas ir pāri veselīgai normai, es gribu vemt laukā. Tas man nedod nekādu labumu. Vienīgi visu saindē. Bailes ietekmē mūsu prātu, emocijas, pat fizisko veselību, bet visļaunākās sekas ir izpostītas attiecības. Bailes liek mums norobežoties un pašizolēties, vai arī kļūt par nikniem suņiem, kuri savu baiļu dēļ metas kost. Bailes ir slikts un pat bīstams padomdevējs.